A veritable all star cast of the fast will again descend on the iconic ‘Speedway by the M4 Freeway’ to kick off the 42nd season of action at a venue that is known worldwide as the home of Australian Sprintcar Racing. A combination of the Ultimate Sprintcar Championship NSW, Speedcars and a twin feature race format for the United Acreage Marketing Late Model Sedans plus the crazy driving Fender Benders will take centre stage with a massive fireworks display and the first Demolition Derby of the season. Aussie Forklift Repairs presents the Lord Mayor’s Gold Cup for the Ultimate Sprintcars and the Lord Mayor of Parramatta Cr. Andrew Wilson will be in attendance to officiate. Last Saturday night Deputy Lord Mayor Ms. Michelle Garrard got her first taste of Speedway action at the official practice session where she saddled up in the back of the Rocket 2-seater Sprintcar for some hot laps. Ms. Garrard was given a first hand look at Sprintcar racing by celebrated champion Robbie Farr who ripped the 900 horsepower race-car around the track in a special closed session for the Deputy Lord Mayor. There’s more than just Speedway as the focus this Saturday night however. In a special initiative with the Parramatta Mission Valvoline Raceway is launching the “Race to drive out hunger” program where race drivers, pit crews, spectators, officials and sponsors are encouraged to bring tins of baked beans, coffee, soup and tuna and place them in collection containers on Saturday night. The Raceway is planning to raise $10,000 through the Go Fund Me page that is set up and provide 10,000 meals for the homeless community in Parramatta and surrounding area. 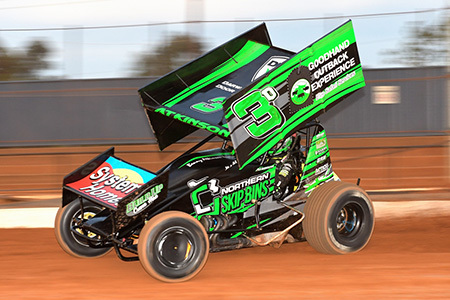 From a Sprintcar stand point the defending champion of the Ultimate Sprintcar Championship NSW Robbie Farr returns and comes off a second place finish in Toowoomba Queensland where he was passed for the lead with only two laps remaining by South Australian rival Steven Lines. It goes without saying that the Milperra born now Gold Coast based superstar will come out all guns blazing against a crack field of rivals this Saturday night. A piece of history will also be created on Saturday night when long serving Darwin driver Ben Atkinson races with his 16 year old son Benny Jr at Valvoline Raceway for the first time – adding to a long list of father/son activity over the 42 years the venue has been going. Many eyes will be on Sydney teenager Jesse Attard in his first race back in Australia after an impressive racing safari in the USA several weeks ago. The list of drivers competing at Valvoline Raceway who have also competed in the USA in the Australian ‘off-season’ includes Matt and Marcus Dumesny, Sam Walsh and Jordyn Brazier. Former USC Champion Jamie Veal is also a welcome addition to the ranks as is former racer Mick Rowell who makes a return to racing in his son Steven’s car after many years away from the sport. NSW muscle man Marty Perovich also makes an Opening Night debut for the first time in many seasons. Gates open: 2pm this Saturday, September 29.